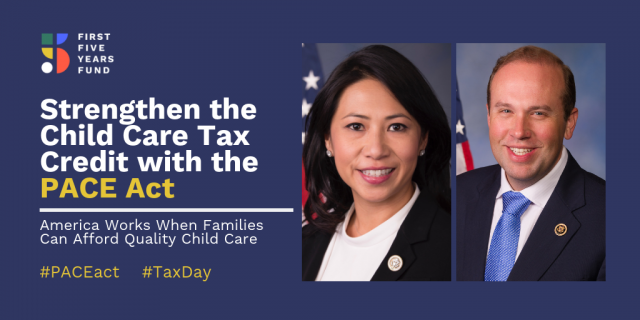 Ahead of Tax Day, bipartisan leaders in Congress have taken an important step toward making child care more accessible for working families across America. Representatives Stephanie Murphy (D-FL-7) and Jason Smith (R-MO-8), along with Senators Richard Burr (R-NC), Angus King (I-ME), Susan Collins (R-ME), Kyrsten Sinema (D-AZ), and Jacky Rosen (D-NV), re-introduced the Promoting Affordable Childcare for Everyone (PACE) Act in the House and Senate, respectively. The PACE Act would update a provision of the tax code, the Child and Dependent Care Tax Credit (CDCTC), to make it refundable and increase its value to better reflect drastic increases in the cost of child care since the credit was last updated nearly two decades ago. There are two major provisions in PACE Act that address the limits of the current tax code to support working families with the cost of child care. The first would improve and modernize the CDCTC by making the credit fully refundable so that it reaches more low- and middle-income working families; increasing the value of the credit for a new top rate of 50%; and indexing the credit to inflation to ensure it matches rising costs of child care into the future. The second goal of the PACE Act is to enhance the Dependent Care Flexible Spending Accounts (FSAs) by increasing the amount of pre-tax dollars families can put into FSAs from $5,000 to $7,500. According to FFYF’s 2018 poll, 81% of voters support increasing the CDCTC to help parents better afford quality child care and early education programs. This includes 67% of Republicans, 81% of independents, and 92% of Democrats. The U.S. has traditionally used the tax code to address real-world problems, and to incentivize behaviors that result in overall economic benefits for Americans. For example, the tax code incentivizes people to save for retirement, encourages homeownership and assists with college education through deductions and exclusions. In the same way tax credits are used to make retirement and higher education more accessible, the tax code should also reflect that child care expenses are often directly linked to a parent’s ability to work. Strengthening the Child and Dependent Care Tax Credit (CDCTC) will help working families who are struggling with the rising cost of quality child care, benefiting the workforce of today – and tomorrow. Learn more about the need to strengthen the CDCTC here.